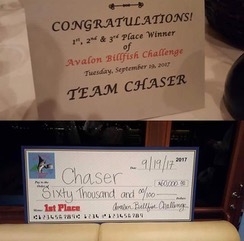 The 3rd annual Avalon Billfish Challenge, hosted by Russ and Jenny Armstrong and daughters Amy and Erin, took place out of Avalon, Catalina Island September 17, 18 and 19, 2017 with 10 boats and many of the top striped marlin fishermen on the West Coast and a top Kona team competing for cash jackpots. Reports had marlin scattered from Santa Barbara Island to the East End of Catalina prior to the start of the ABC, however marlin fishing during the tournament proved to be slow. It was as if the fish had been tipped off and were laying low for a few days. Mary Schickling and Denny Friedrich sat at tournament radio control on a Catalina mountaintop providing excellent coverage of events. Day one produced several bites and a few fish lost after brief fights. Team Swagger boated a fish at Osborne Bank and, although it met the minimum length requirement, it did not meet the minimum weight requirement of 175-pounds and was disqualified without penalty. Day two produced another handful of opportunities for many of the boats but, ultimately, only team Chaser, with Captain Jimmy Kingsmill, Shane Hurt, Pat Holmes, Pete Groesbeck and owner Greg Chase aboard, succeeded in releasing a striped marlin for a total of 100 points and across- the-board winnings of $60,000.00! This team from Dana Point and San Diego has had their eye on the prize for the past three years placing 3rd in 2015, 2nd in 2016 and, finally, taking it all in 2017. Oddly enough their combined fishing talents did not really factor into the initial hookup. The marlin went for a sinking lure as the boat slowed to bait a fish that came up on a daisy chain. The quick reaction and skill of captain and crew resulted in a solid hook-up and ultimate release of the marlin. The tournament banquet was held at Ristorante Villa Portofino on Tuesday night where participants enjoyed dinner and raffle prizes generously provided by Tony and Jason Greyschock (Fishing Boats Unlimited), Dave and Derek New (Basin Marine), John Woods (Precision Marine), Dave Beek (Island Marine Fuel), Pat Werner (Balboa Boat Yard), Tracy Melton and Manager Jeff (Angler’s Center), Steve and Margaret Bray (Steve’s Steak House) and Caleb Lins (Lobster Trap). Anglers enjoyed hugs and kisses from retired weigh master and Guest of Honor, Rosie Cadman. 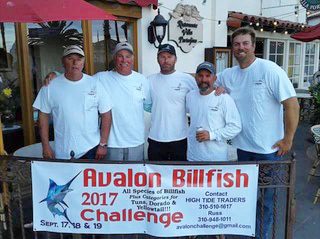 Avalon Billfish Challenge is a jackpot tournament focusing on and encouraging catch and release fishing and is open to all anglers. 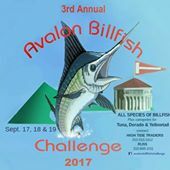 For information on next year’s tournament please follow us on Facebook at Avalon Billfish Challenge or contact us at [email protected]. Happy to say I got in a good amount of fishing last week. Midweek, I got in a couple sessions off the sand.